The private sector has a crucial role to play in reducing and managing waste better. In terms of household waste, private sector developers and residential management companies can do a lot to help reduce, reuse and recycle. Not only do they manage a substantial chunk of Hong Kong private housing estates, but private sector management companies are also supervising an increasing number of public housing estates. 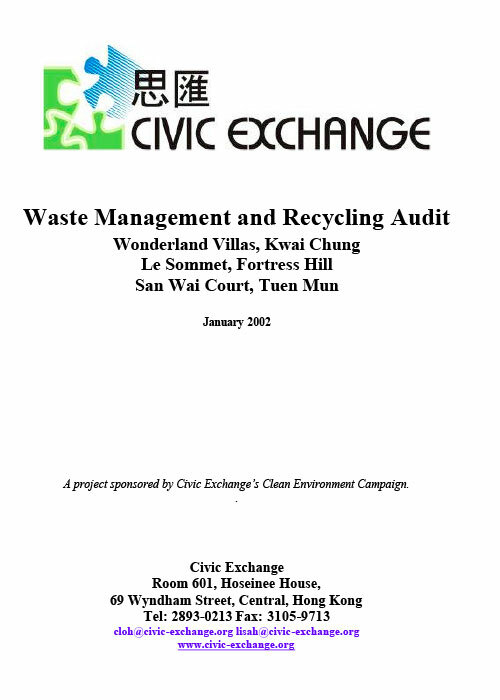 Civic Exchange carried out a series of audits and surveys in three Hong Kong residential blocks, two private estates and one public housing estate, between July and October 2001 to find out about waste compositions and existing recycling habits and facilities in order to see how waste management systems can be improved. The information gathered is likely to be typical of Hong Kong as a whole.